Read an interview in Metro with Wouter Valkenier, the architect who designed succesful Amsterdam restaurants and cafés like Hannekes Boom, De Ceuvel and Bret! 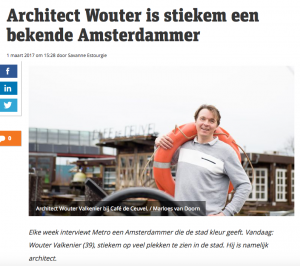 Wouter and his family will live on one of the water houses of Schoonschip: “It will be a house built of mooring posts, and it will be completely selfsupplient. That’s where my architect’s heart starts to beat“. Click here for the full article (in Dutch, 1st of march 2017).